Hamas organizing new wave of clashes on Israel-Gaza border to mark 51st anniversary of 1967 Six Day War. Israeli security officials are preparing for a new wave of confrontations on Israel’s border with the Gaza Strip this week, as the Hamas-ruled Gaza Strip marks the 51st anniversary of the Six Day War. Dubbed the “Naksa Day”, or “Day of the Setback”, the anniversary of the start of the 1967 Six Day war is observed by Gazans and many Palestinian Authority residents in Judea and Samaria as a day of mourning and protest. This year, Hamas has ordered that most of the demonstrations and riots marking Naksa Day – which falls on Tuesday –be delayed until Friday. Organizers of Naksa Day events say the delay was made in order to synchronize Naksa Day with “Jerusalem Day” protests slated to take place in Iran, Yediot Ahronot reported. But Hamas leaders may also be playing for time, looking to test whether an unofficial ceasefire with Israel holds. 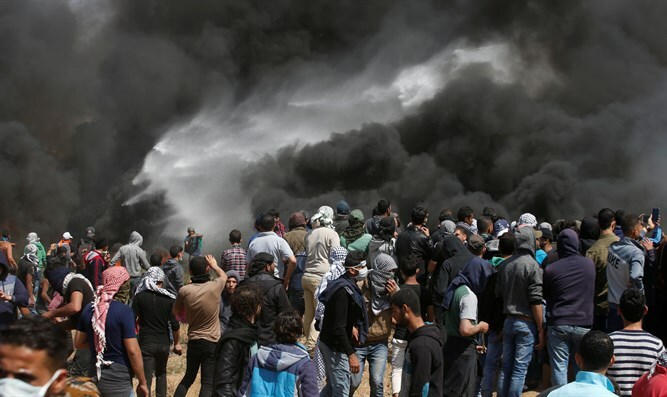 Last week, the Hamas terror group reportedly agreed, via an intermediary, to an unofficial ceasefire with Israel, following the most serious escalation on the Gaza front since the 2014 conflict, dubbed “Operation Protective Edge”. Gaza-based terror groups fired more than 80 rockets and mortars at Israeli towns near the Gaza Strip, prompting Israel to launch a wave of airstrikes, hitting dozens of Hamas and Islamic Jihad targets in the Strip. Despite the ceasefire, however, Gaza terrorists have continued to spark fires on the Israeli side of the border, using “terror kites” to drop incendiary devices on Israeli farmland. Terrorists have managed to torch some five million shekels ($1.4 million) worth of Israeli property with terror kites since the beginning of mass-riots on the Israeli border on March 30th. On Sunday, Prime Minister Binyamin Netanyahu instructed Meir Shabbat, chief of Israel’s National Security Council, to deduct money from the taxes collected by Israel on behalf of the Palestinian Authority in order to compensate Israeli farmers harmed by the terror kite arsons. Israeli security officials say that despite the call to delay most “Naksa Day” events until Friday, thousands of rioters are nevertheless likely to gather Tuesday at the Gaza border to clash with IDF forces and attempt to breach the Israeli security fence. IDF officials estimate that roughly 5,000 rioters will gather at six different sites along the Israel-Gaza frontier Tuesday. Israel has deployed extra forces to the Gaza border and nearby towns in preparation for the riots.